COCOA BEACH, Florida - The highly venomous and potentially deadly box jellyfish have returned to the nearshore waters of Cocoa Beach, Florida, on Tuesday, September 6, 2016. Although the Atlantic Ocean species of box jellyfish, Chiropsalmus quadrumanus, does not pack the extreme potency of the infamous Australian box jellyfish dubbed the sea wasp, the species that washes up on Florida's beaches can still be life-threatening and has a painful sting. Florida Fish and Wildlife Commission officials have previously collected this jellyfish species offshore of Florida's Space Coast. So it is not completely out of the ordinary for the box jellyfish to appear on Brevard County beaches. In fact, Brevard Times reported a previous sighting back in July. 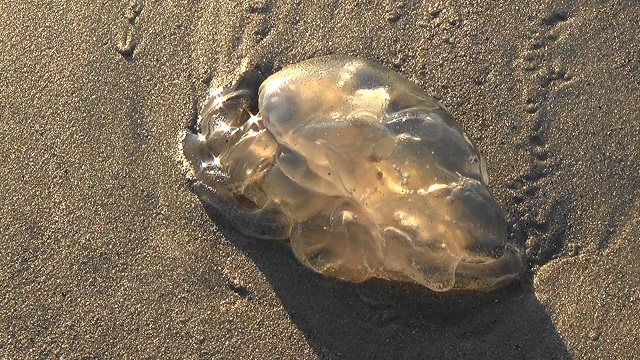 What makes this jellyfish more dangerous to beachgoers than the Portuguese Man o' War is its translucent color which makes it harder for swimmers to see the box jellyfish nearby. Additionally, the box jellyfish's clear bell could be mistaken for other, less-venomous jellyfish that commonly wash up along the Brevard County coastline. The box jellyfish can be identified by it's box-shaped bell. On each of its four corners, there are stout, hand-like structure where up to nine tentacles dangle. If you encounter a sting that results in fainting, shortness of breath, chest pain, scratchy throat, or hives that occur on skin in areas away from the site of the sting, these symptoms may be indicative of a more severe reaction. You should immediately call 911 and contact the nearest lifeguard if possible.